Infrared dimmers – Govena Lighting S.A.
Govena dimmers enable seamless adjustment of illumination power. They are produced as OEM and Govena-branded modules for customers as well as finished product, so-called “Metal Line”. Touch or IR-controlled by any infrared remote control – a special simple procedure to program any randomly selected button. 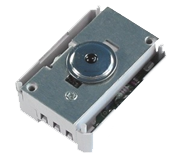 It is also possible to use a factory YRC8 remote dedicated to dimmers. We also make PROT and PROI dimmers with software which performs many additional functions, e.g. “nursery” – gradual “putting to sleep” – dimming down for up to one hour.